A brand is a simple thing, but because we can’t put our hands on it or hold something tangible up to show what a brand looks like, it’s a bit mysterious. And to the small or solo business owner can feel all too much like a weird waste of time. That unfortunately leads too many people to ignore their brand and go about doing the work of their business. The funny thing is the same “branding is stupid” people will turn around and have you write every single detail about your ideal customer, determine how you want to position yourself in the marketplace, and make your marketing share a cohesive message about who you are. 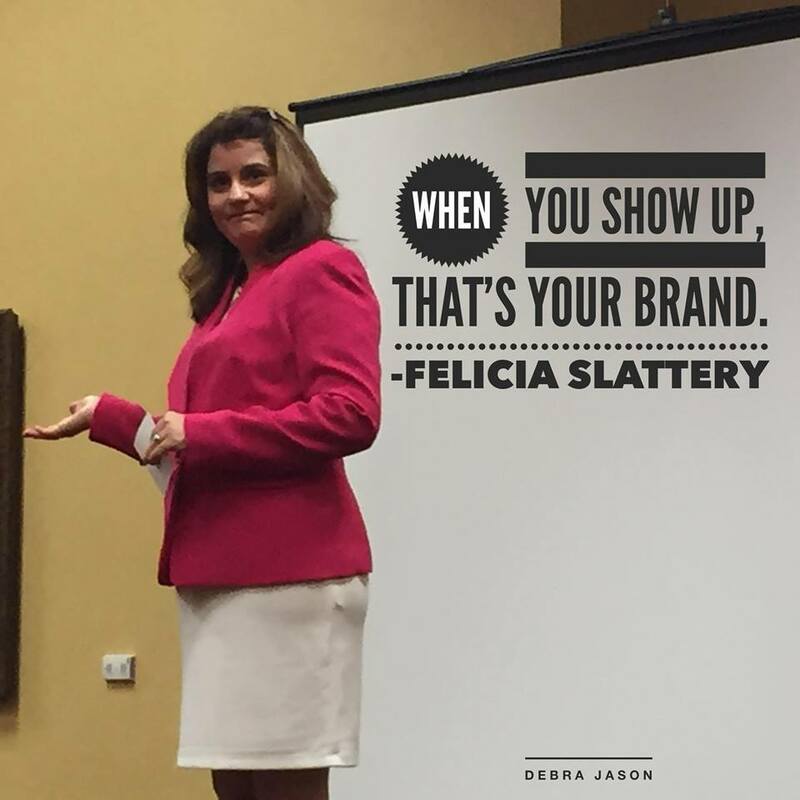 BRANDING: The perception of you in the marketplace based on the experience of YOU – both personal AND your business – that you provide through all the methods of communication you use including social media, video, email, on webinars, on stage, and face to face in person. It’s what you say, what you do, and how you say it and do it. While my Mom and Dad were recently visiting, the topic of Facebook came up. Overall, my parents disapprove highly of Facebook and they don’t like how and what I post. They think “it’s too personal.” My husband, also a small business owner, and I tried to explain to them Facebook, for anyone in any kind of business, is about building your brand one post at a time. I like food: Food is one area of commonality among all human beings. We must eat to survive. Food is the great equalizer. HOW I eat and what I eat tells a bit about me and how I live my life. That’s part of the experience of me. I’m in business: Social media is about being social, yes. But don’t forget if you are in business, you need to throw in a business post or two once in a while. As you can see, neither of my two business-related posts on this day suggested you go “buy my stuff.” But the message is clear, I have a website, and I’m leading a challenge right now. I have a life: I’m wishing a friend and colleague happy birthday and sharing a story about my family and our dog. Well, from just these 5 Facebook posts on this one day you can learn a lot about me. You can see I use smiley face emoticons and more than my fair share of exclamation points, and post funny, quirky, inspirational, sweet things and often with gratitude, regularly connecting to and directly mentioning others in my posts. Looking back now at those words, that’s pretty much my personal brand summed up. I make A LOT of sales to people I am connected with on Facebook and other forms of social media. Why? Many have told me directly it’s because they enjoy the experience of me as much as what I can teach them or help them achieve. When you are 100% clear on the experience of who you are and what you want people to feel and think and learn ABOUT as much as FROM you, making a sale becomes easy because you’ve already built a relationship with the person – sometimes only in their minds. People will feel like they have gotten to know you, without ever meeting you, or even without ever interacting with you online because you share openly and freely who you are and what you’re about via social media, video, on stage, on webinars, and through your email list. It’s impossible to fade into the background and look like everyone else. You’re YOU and the only YOU there can ever be. It’s as close to being magnetic as you can get. Being you is how you attract the kind of people who will love to work with you – and who you love working with. And that is where the problem comes in because it looks almost mystical. But nothing could be farther from the truth. When you tap into the experience that is YOU and know how to share that effectively, business (and life!) becomes a lot more fun and profitable. When you get clear on your brand and communicate that effectively, your business will change and life gets a lot more fun in the process. It’s one of the things I help my clients do. If you are interested in learning more about how I work with my clients, you can check out a few details on my website here. I have one word… which you drilled in my little stubborn head – Bacon! You preached, I ignored, but then I listened I and saw the light! You are so right! and thanks for your persistence and continued support and not giving up on what you believe… I love and respect this post!